Every blessing was fulfilled﻿—even though we didn’t get what we desired most. “I never asked God for anything that He didn’t then give me,” my wife, Deborah, said. This statement still astonishes me even though I was with her throughout its fulfillment. And it probably astonishes all those who know of Deborah’s seven-year struggle with systemic lupus, her two-year fight with breast cancer, and her eventual death on September 19, 1990. But those who are amazed and astonished may not understand priesthood blessings or their fulfillment. It was with difficulty that I learned for myself what it means to hold the priesthood and to exercise it to bless others. Although my parents were both active in the Church and faithful to its precepts, I don’t remember the priesthood being a specific spiritual influence in my childhood. I don’t recall being sick enough to need a blessing and have no memory of priesthood blessings administered to others in my family. This lack of emphasis on priesthood blessings carried over into my own family when I married and my wife and I had children. I gave priesthood blessings if someone was seriously ill or was having an operation. I also gave my wife a few blessings for emotional help, but those occasions were rare. Giving a blessing was always a positive experience for me. But a lack of understanding and a shortage of self-confidence limited my exercise of this priesthood function. I struggled to know the words to say, unsure if what came into my mind was really what God wanted. This situation changed little when my wife discovered she was suffering from systemic lupus. Those years of battling a disease of exhaustion and discomfort were aided by only occasional priesthood blessings. My wife was aware of my uneasiness about giving blessings and seldom asked for the additional spiritual help she may have desired. In March 1989, when the doctor announced that my wife had cancer, our lives were altered. Because of the exotic nature of her cancer, it had eluded physicians for two years. By the time it was finally diagnosed, it had spread and her chance for recovery had significantly diminished. Knowing we were in a struggle we could not win on our own, we further opened our lives to spiritual help. Our ward fasted for Deborah, and we gratefully accepted the care of the Relief Society. Her battle became one fought by many. A friend who had endured the same chemotherapy my wife was about to receive confided that during the most difficult periods of the treatment, he had requested and received priesthood blessings. He advised us to do the same﻿—to seek spiritual help in order to tolerate the effects of the treatments. The chemotherapy was difficult. My wife experienced all the expected reactions. She was sick for several days after a treatment. She spent most days in bed, and eating was a chore. But little by little we learned how to confront each challenge as well as possible. During this difficult period, my wife, as our friend had advised, called on me for priesthood blessings. I gave her a blessing to help ease the anxiety she experienced the first week of chemo. Through a priesthood blessing, the fear accompanying an operation﻿—though not completely eliminated﻿—decreased. Long periods of vomiting stopped and sleep replaced restless nights as I laid my hands on her head and blessed her. These blessings gave us promises of help and comfort, intermingled with glimpses of the future. They filled us with warmth and joy. I wish I could say that giving blessings became easier for me then, but I can’t. I gave the requested blessings, but my difficulty in exercising the priesthood persisted. I never mentioned my discomfort to my wife, but she could sense my reluctance. However, these were difficult trials, and she knew she was entitled to help and I was the conduit through which she could receive it. So when she needed help, she asked. Before giving any blessing, I knew what I wanted to bless her with: I wanted more than anything to bless her to be healed. And she wanted that too. But that blessing never came. What did come were blessings of comfort, which didn’t take the trial away but made it easier to bear. Slowly I began to understand better how the priesthood and priesthood blessings work. Giving blessings wasn’t a tool to get what I wanted but rather a way to receive needed help. I learned to trust in the Lord and His will instead of what I thought needed to be done. I gained confidence that the words that came to my mind were indeed the words God wanted me to say. And while giving blessings has never become easy for me, I have learned to trust in the feelings I have while giving blessings. After Deborah completed her treatments, we began the difficult phase of waiting to see if the drugs had been effective. We enjoyed this time free of doctor’s appointments, tests, and treatments. However, in the back of our minds was the fear that some cancer had been able to survive the onslaught of the poisonous anticancer drugs and was reestablishing itself. Little by little, small physical signs convinced us of our greatest fear: the treatments had not been successful. The doctors were upbeat, but we knew it was a matter of time. The last six months of Deborah’s life were incredibly calm. After one last procedure failed, we decided to discontinue the treatments and to go home and enjoy what time was left. Some may not believe that it was a wonderful few months, but it was the best time of my life. During this period some concerned friends and family suggested that we needed to be more assertive with the Lord in our battle to save her life. They told me that I had the priesthood and should use it to cure her. Though I understood their feelings, these friends didn’t understand what was happening. There was nothing I wanted more than to promise Deborah life, but those words never came while I was giving her a blessing. There was little she would have desired more than to have a blessing of health, but she never felt she should ask. We both believed in miracles but also recognized our limited perspective on an experience that fits into an eternal plan. What did happen was a greater miracle. In the blessings, she was never promised life but was given the indisputable assurance that what was happening was God’s will. She was not promised ease but was given help to endure the difficult times. She was not allowed to stay and raise our children but was assured of eternal bonds. She passed away with only limited pain and discomfort, with her family at her side. 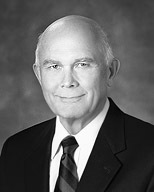 Elder Dallin H. Oaks of the Quorum of the Twelve Apostles, “Healing the Sick,” Liahona and Ensign, May 2010, 50.